Glaucoma is a neurodegenerative disorder attributed to a multifactorial etiology. The major factor responsible is supposedly a defect in the balance between aqueous humor (AH) production and outflow through the eye, thus affecting intra-ocular pressure (IOP). This abnormal IOP is the main risk factor for optic nerve damage in glaucoma patients. Thus, understanding of glaucomatous optic nerve degeneration (GOND) requires a clear knowledge of AH physiology and IOP. Currently, IOP is assumed to be a major risk factor and perhaps the only factor which can be controlled. IOP can be controlled medically, by laser, surgery or other means. Among the pharmacologic agents, most decrease aqueous humor (AH) production or increase the aqueous outflow through the unconventional uveoscleral route. Among these agents, an important group is one of carbonic anhydrase inhibitors (CAIs). This group includes both systemic (oral and intravenous) as well as topical agents. CAIs reduce aqueous formation and play a role in improving ocular blood flow. Thus, CAIs form an important group of agents which need to be studied in more detail to understand their indications, mode of action, side-effects and any new developments which can be useful for the practicing clinician. There are a number of theories to explain the formation of AH. These include: the dialysis theory; active transport/secretion theory and the ultrafiltration theory. According to the active transport theory, AH formation is an energy-dependent process. This energy-dependent process is able to move substances across a concentration gradient in a direction opposite to what would be expected by passive mechanisms alone. 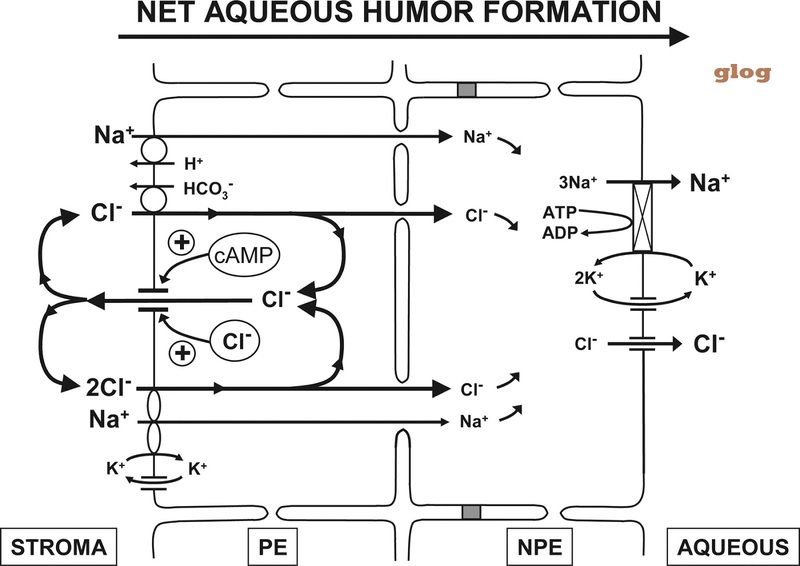 The presence of higher concentrations of ascorbate, lactate and some amino acids in AH, compared to plasma levels, suggest the role of active transport. Studies have shown that the ciliary epithelium pumps substances against their concentration gradient, so that their levels are higher in AH compare to that in plasma. This is achieved by the utilization of certain enzyme systems in the ciliary epithelium. Thus, the levels of bicarbonate are found to be higher in AH compare to plasma (34 mmol/kg H2O vs. 24 mmol/kg H2O). 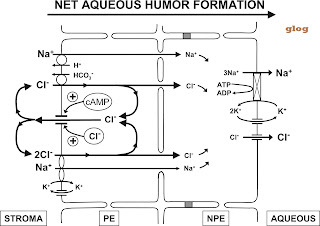 CA plays an indirect role in AH formation by providing hydrogen or bicarbonate ions for an intracellular buffering system. Humans have 16 isoforms of CA (with 13 having catalytic activity). Human eyes contain CA I, II and IV. CA I and II are present in the cytosol while CA IV is membrane bound. CA IV was detected in the ciliary processes of mice, but not in the human ciliary processes. It was also found that patients who lacked CA II had no effect of intravenous acetazolamaide on IOP. Thus, it is likely that CA II plays a major role in AH secretion. CA is an ubiquitous enzyme found widespread in nature among animals and photosynthesizing organisms including bactieria. It has also been found recently in some non-photosynthesising bacteria. There are 5 genetically distinct families of CAs. These include: CA α, β, γ, δ, ζ. All of them are metalloenzymes. CA α, β, δ use Zn++ ions at the active site; CA γ has Fe++ ions (but is also active with Zn++ and Co++), while CA ζ uses Cd++ or Zn++. CA α is usually present as monomers, but can rarely occur as dimers. CA β can occur as dimers, teramers or octamers; CA γ are trimers; whereas δ and ζ are probably monomers. CAs also play a role in respiration and transport of CO2/bicarbonate, pH and CO2 homeostasis, electrolyte secretion, biosynthetic reactions (gluconeogenesis, lipogenesis and ureagenesis), tumorigenecity and photosynthesis. They may also be responsible for other biosynthetic reactions in some bacteria, algae and plants as well as, in CO2 fixation in diatoms.